In 1766, one hundred years after Newton’s separation of white light through a prism, a book appeared in England with the title «The Natural System of Colours» (historical illustration). In this work, Moses Harris (1731-1785), the English entomologist and engraver, examines the work of Isaac Newton and attempts to reveal the multitude of colours which can be created from three basic ones. As a naturalist, Harris wishes to understand the relationships between the colours, and how they are coded, and his book attempts to explain the principles, «materially, or by the painters art», by which further colours can be produced from red, yellow and blue. Harris builds upon the discovery by the Frenchman Jacques Christophe Le Blon (1667-1742). Le Bon is credited with the invention of colour printing. In 1731, during the course of his work, he observed something which every school child now learns: namely, that three paints coloured red, yellow and blue are sufficient to produce all other colours. Although Le Blon invented the fundamental three-colour palette and demonstrated his system with many dyes, he did not extend his ideas to a properly organised colour-system; that was for Harris to accomplish. Harris introduced the first printed colour-circle in 1766, specifying his primary colours very exactly: red was cinnabar, which could be made from sulphur and mercury; yellow was King’s yellow (an artificial orpiment); and ultramarine was used for blue. Harris distinguished between the harmony of the «prismatic or primitive colours», which are assigned a «prismatic circle» (we show this to the left, large) and «compound colours», which are allotted their own circle (to the right, and smaller). The word «prismatic» could at first lead to confusion. In fact, Harris did not mean the spectral colours observed by Newton after light had passed through his prism and then arranged in a circle; he meant the unmixed pigments («grand or principal colours»). 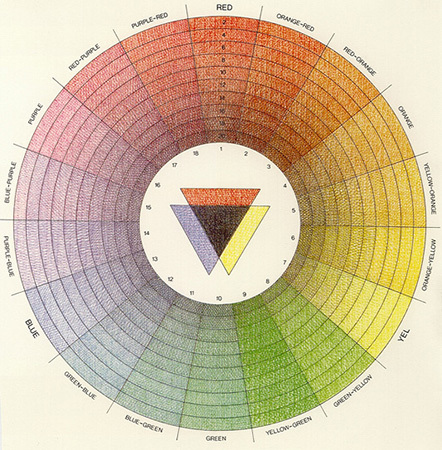 A mixture («compound») of the three basic colours will result in the three intermediate colours («mediates») mentioned: orange, green and purple, which also appear in the prismatic circle and are all brought to life with natural descriptions («fruit or flower»). According to Harris, the three main colours, red, yellow and blue, are: «the greatest opposites in quality to each other and naturally take their places at the greatest distance from each other in the circle». 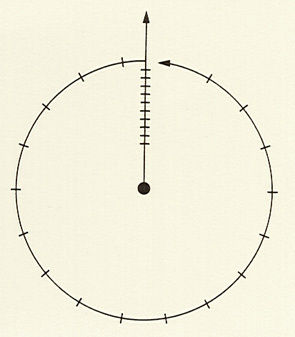 In order to arrange this «greatest distance» evenly within the circle, Harris requires an even number of circle segments (illustration), and Newton’s seventh colour, indigo, is therefore dispensed with. In his system, of the six colours now available Harris recommends the mixing of each adjacent colour in such a way that one of these two components will predominate in each case. 18 colours will thus arise to complete the circle in the sequence red, orange-red, red-orange, orange, yellow-orange, orange-yellow, yellow, green-yellow, yellow-green, green, blue-green, green-blue, blue, purple-blue, blue-purple, purple, red-purple, purple-red. Because Harris subdivided each of his three initial colours with the aid of concentric circles into 20 different saturation levels, his method creates a total of 360 hues in the prismatic circle. If we wish to explain what happens with Harris’ subtractive colour mixtures, we should not only concern ourselves with the spectral composition of light and talk of wavelengths; we should also take account of the impression of colour created by our minds when only a part of the spectrum enters our eyes. In this case, it is evident that colours are never biased, and are always to be understood as an interaction — in this case an interaction of physics and perception. We can separate the whole of the visible spectrum into three areas: blue is short-wave electromagnetic radiation, green is medium wave, and red is long wave. A surface will appear to us as red when it reflects the long-wave spectral colours and absorbs what remains. A surface will appear yellow when it reflects radiation only from the medium- and long-wave part of the spectrum, and will appear blue when only short- and medium-wave light reaches our eyes. By superimposing one colour upon another, Harris progressively removes a component of radiation (subtraction). If yellow and blue are placed one above the other, only the medium wavelength will remain, and our brains will see the colour green. If red and blue are superimposed, only the short-wave end of the spectrum will remain, giving us the impression of violet. If all three come together, then no component will remain: «Lux nulla», we could then say, meaning the black appearing in the centre of the prismatic circle. (The dark brown in the middle of the mixed colour circle can also be explained in a similar, but nevertheless more complicated way.) Harris’ book is a rare example of its type: only three copies have survived the passage of time, and only one is in a satisfactory condition. With the support of the American art historian Faber Birren, the copper plates — originally hand coloured by Moses Harris — were restored, and published in 1963 by the Whitney Library of Design in New York. Date: The engraver and entomologist introduced The Natural System of Colours between 1766 and 1770. 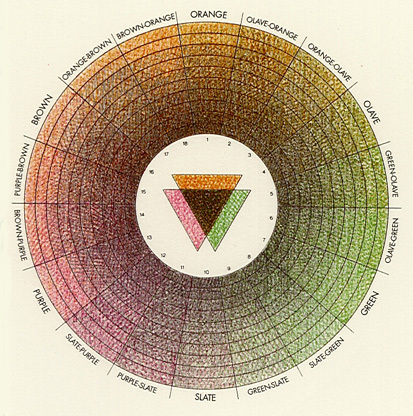 Bibliography: M. Harris, The Natural System of Colours, Licester Fields, ca. 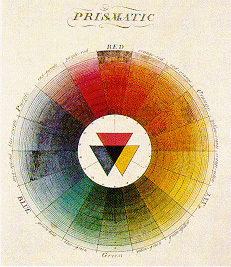 1766; C. Parkhurst and R. L. Feller, “Who Invented the Color Wheel?”, Color Research and Application 7, pp. 217 – 230 (1982); W. Spillmann, “Color Systems”, in H. Linton, Color Consulting, New York 1992, pp. 169 – 183; John Gage, Colour and Culture, Practice and Meaning from Antiquity to Abstraction, Thames and Hudson, 1993, pp.194, 203, 221(mention and comment).